Breaking News - Vinca's 2012 colt, Heirloom, was GAIG/USDF East Coast Foal Champion at Devon! Vinca's 2010 colt, Fiorello, was GAIG/USDF East Coast Reserve Champion Colt or Gelding at Devon! 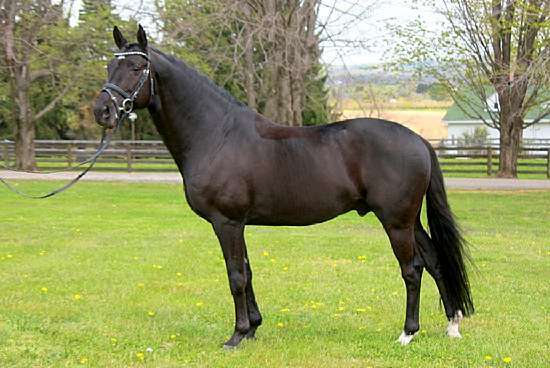 Vinca is the grandson of two Olympic Stallions. Ferro competed in Dressage at the Olympics but competed in show jumping at the Grand Prix level before his career change. Idocus, also an Olympic dressage competitor, won the jumping portion of his 100 Day Stallion Test. On the mare lines, Vinca's paternal grandmother is by the famous foundation sire G Ramiro Z and his maternal grandmother was an Approved, Premium Thoroughbred mare. At Verbella's Mare Test, the examiner stated that there is "a responsibility to American Sporthorse breeding to keep this mare bred". Vinca shows world class talent for dressage with an OUTSTANDING canter coupled with his unique desire to please. However, he also has a spectacular jump which earned 8s at the ISR/OLD Stallion Licensing at Hilltop Farm in June 2007. He scored an impressive 217 points at the Licensing and earned the judges comment that he is truly an all-around sport horse who fits the bill of what modern mare owners are seeking. Vinca also completed the 2007 ISR/OLD 100-Day Stallion Testing in Paxton, OH, placing ninth. In 2006, Vinca received the coveted 'Born in the USA' Stallion Award at Dressage at Devon. Vinca's foals place in the Top 10 at Dressage at Devon each year, and also qualify for the GAIG/USDF East Coast Championships in their respective divisions. His foals have continued to do well at the ISR/OLD inspections, with the 2008 filly <a href="veronica.php">Veronica becoming Hilltop Farm Inspection Site Foal Reserve Champion with an 8.3 -- there were a whopping 33 foals presented at this inspection. Vinca passes down his unmatched work ethic, with a high level of rideability from day one. To view more of Vinca's progeny, please visit <a href="progeny.php">Here</a>. Meghan Garland, trainer at Swan Lake Stables in Littlestown, PA, says, "I have worked with Vinca and his offspring. Vinca is sweet, athletic, and versatile. Our barn has bred to him, and we have bought his get for our clients. The rideability, attitude, and talent of his sons and daughters make them among my all-time favorites to work with - they are exceptional." Son of Olympic Ferro, Metall had the highest marks for the "M" year. 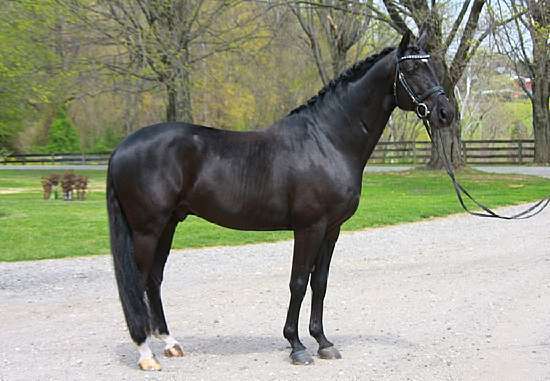 He is an extremely well-shaped stallion with a marvelous, long neck, a beautiful head and very balanced movements. His character is of the highest order. Metall already has sons appointed for the second inspection at 's-Hertogenbosch. His offspring inherit his stunning conformation, and a high degree of quality and refinement. They are built very uphill and have beautiful heads. Their movements show great finesse with much power in the hind legs, lots of elevation in the front legs and they have very supple backs. 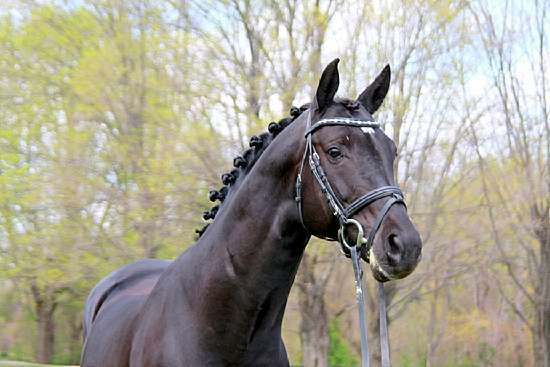 Metall was champion of the 2001 indoor Brabant stallion with offspring examination. Metall participated in several stallion competitions in 2001, and was first at Groesbeek and Weert, second at Hengelo and reserve champion at the finals at Den Bosch. A 16.3h "Approved" Dutch Warmblood Stallion, Idocus is also approved ISR/OLD and by the Oldenburg Verband. Idocus was been presented at the Hengstkeuring in Den Bosch in Febuary 2001. He was accepted to go to Ermelo for the short 3 week test of the 70 day stallion performance testing. He was reviewed by the stallion committee and was named an "Approved" stallion at the end of his testing on March 31st, 2001. Idocus is the first stallion to be born in the Netherlands, "made" in the USA and returned to the Netherlands for Approval! Idocus was the KWPN-NA 2007 Horse of the Year and has had an extensive and successful International Dressage career, representing Holland in the 2004 Olympic Games and representing the USA at the World in Cup Las Vegas and the World Equestrian Games in Aachen. He is also the only horse to win the Dressage at Devon Breed Show as a youngster and go on to win the Devon Grand Prix as an adult.